As corporations increasingly recognize the benefits of green marketing, the number of projects with important local environmental, economic, and quality-of-life benefits shall increase. Encouraging the holistic nature of green, moreover, inspires other retailers to push the movement. 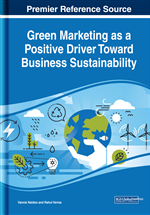 Green Marketing as a Positive Driver Toward Business Sustainability is a collection of innovative research on the methods and applications of integrating environmental considerations into all aspects of marketing. While highlighting topics including green consumerism, electronic banking, and sustainability, this book is ideally designed for industrialists, marketers, professionals, engineers, educators, researchers, and scholars seeking current research on green development in regular movement. Rahul Verma is a Lecturer in Management with Department of Training and Technical Education, Govt. of NCT of Delhi, India for the last 7 years and also pursuing Ph. D. in Commerce from Mewar University. His research interests include Digitalization and Cyber Spaces. He has attended more than 10 national and international conferences and has presented papers in more than 7 national and international conferences. He has published more than 5 research papers with prestigious publishers and edited one book on Digitalization published by IGI Global. He is also on editorial board of peer reviewed prestigious journals.